Our Sunday Lessons are specialized 1 on 1 or 2 on 1 goalie to coach ratio available year round. 2 on 1 lessons will be paired based on ability/level when possible. 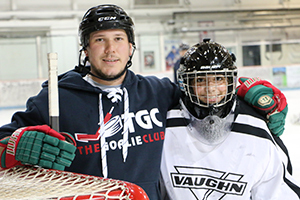 Goalies will get customized training from a TGC certified coach who will help to improve your game. TGC can be scheduled to come to your rink or scheduled at Shattuck St. Mary's Arena. TGC will work with you to find time to train. Prices vary based on location. Contact Us to arrange times and/or locations that work for your schedule or check our our SSM schedule below. TGC Sunday Lessons are ideal for goalies wanting a 1 on 1 experience and working at your own pace. Lesson plans vary depending on the experience of the goaltender. TGC works with a variety of Goalies playing Mite through Pro. Skills to be taught during private lessons are, but not limited to; skating, crease movement and slides, positioning, save selection, angles, net play, use of stick, rebound control, Blocking vs. Reacting theory, walkouts, wraparounds, cut-ins, pass outs, passing, shooting and much more. Coaches participating in Private Lessons this winter are Coach Des, Coach Grant, Coach Grady, Coach Isaak, and Coach Kermit. To learn about our coaches click here. If you would like to be notified in the event that goalies are needed for a 2 on 1 training sessions, send us an email with your name, age/skill level and phone number. This is a great option for goalies looking for a partner to train with and reduce the cost in half. Have any questions about our SSM Sunday Lessons? Want to set up a specific date/time schedule or see a list of available dates? Shoot us a text at 612-210-5944 or send us an email. All sessions are one hour unless noted. Skating is the foundation of goaltending, therefore the first 15 minutes of all lessons begin with this regardless of 1-1 or 2-1 ratios. We will then have a quick stretch, chalk talk, and review of the lesson we have prepared for the session. Lessons may be held on any of the three rinks at SSM. Due to rink maintenance and situations out of our control, the Arena staff may move lessons to the old, new, or mini rink. It is the responsibiliity of the goalies/parents to check the rinks when arriving to Shattuck.